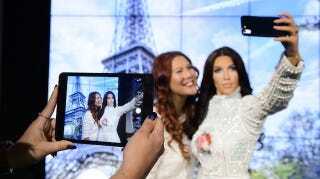 Your dreams of taking a selfie with the selfie queen Kim Kardashian taking a selfie can now be real. Madame Tussauds in London has unveiled a wax figure of Kim Kardashian holding up a phone, ready to capture her infinite greatness via self-portrait. Wax Kim—which cost $230,846 to make—is currently wearing the same Balmain dress that Real Kim wore for her Kanye West-wedding bachelorette festivities. However, of course, the wardrobe will be swapped out over the summer to avoid repetitive photo ops. Madame Tussauds have gone one step further with their tribute to Kimmy K, adding in a background that continuously changes scene, allowing guests to observe the selfie queen’s ‘three image rule’ of not posing for more than the magic number of pics in any one location. Wax Kanye will be added at a later date, so that Kim won’t be alone for too long.